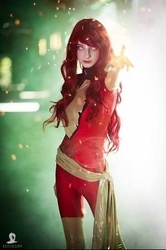 Haiden Hazard is a cosplayer from east Alabama who began cosplaying early 2012. She has always had an interest in anime, gaming & comics and as she was looking at some of her favorite characters, she one day decided she wanted to dress up like them before even knowing what cosplay was. She attended her first convention as Suigintou from Rozen Maiden and was very well received. Quickly she discovered how much she enjoyed conventions, cosplaying and crafting outfits from scratch. As she attended more and more conventions her cosplays began to become increasingly more elaborate and difficult to construct. So far, Haiden has won many cosplay contests, has been featured in many websites and news reports for conventions.